I started school in 1969. 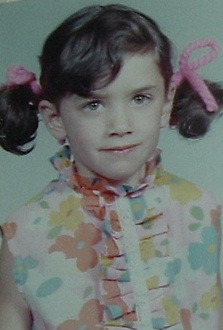 See how pathetic I looked in kindergarten? I didn’t trust the photographer at all! When I started school, our neighborhood was bustling. Their were kids popping out of everywhere. We had two elementary schools within three blocks of us and they were filled to capacity. Because of it, we were bussed to a school at 10 minutes away up the hill. My elementary school was one building with a long hall. When I was little I thought that school was huge. I remember that the kindergarten class was at one end. Then on the left hand side it started with 1st grade through 3rd and on the opposite side it was 4th through 6th. There was a double door at the end of the hall that lead to the main entrance, the offices, and the cafeteria. The cafeteria was also our assembly room. At one end was the kitchen. At the other end was a stage for our school programs. Outside, by the kindergarten classroom, there was the portable where the reading center was. This was where all the tutoring took place. The playground was pretty large. We had a jungle gym area with bars to climb on. The black top with four square, tetherball, and hop scotch areas. There was a field off to the side of the cafeteria where we played softball, football, and parachute. Then there was the upper hill, which was off limits except to the older kids. Our classrooms were normal sized I think. Almost every year I went to school I was in a divided class (1st and 2nd, 2nd and 3rd, etc.) and they were large enough for about 15 of each grade. If I remember correctly there were two kindergarten classes and then one class for each grade and one split class room. That comes out to 10 or 11 classrooms. Hey, you’re talking 35 years ago. I can barely remember where the bathroom is in houses I’ve visited recently. When I look back, of the three elementary schools in my area, this was probably the smallest. Most of the others had multiple buildings and large playgrounds. I was one of the good kids who never got in trouble and always finished my work early. So, I got to experience some of the other areas of the school. I spent considerable time in the reading center helping kids learn to read. I worked in the cafeteria as a milk monitor and kitchen help (try to get me to do that at home!). I also worked in the office helping the secretary, Mrs. Phelps. My elementary school was integrated long before I got there. But, it was only a couple of years before that girls won the right to wear pants to school. As a child I thought this school was huge. But, then I went to Junior High. And then, my high school dwarfed both of them. I haven’t been back to my school since I graduated 6th grade. It’s still there. It got pretty run down by the 1980s and the neighborhood became a little poorer. They’ve upgraded it in the last few years. It was one of the lucky ones. In the late 1970s, they began to assess population and determined that their were less children in the area. One of the larger elementary schools was sold and then turned into apartment buildings. Others vanished, too. I wonder what I would think if I went back to Hillside today? I think if I went back today that old elementary school would seem very small. I grew up In San Leandro. When I left grade school there were so many kids that they had brought in portables. There was a new high school too. By the time I was 25, they’d sold the elementary school, tore it down and put in houses (populated by young families with children!) Sold my Jr. High to a Christian group for a school, and closed the high school as well. I don’t know what they are doing for schools now as we left CA and now live in OH. But it is sad to think of there being nothing tangible left of my school years.